In reality, I keep asking him back because I know him, respect him and appreciate his wisdom as a married man who can shed light on an area that, well, I cannot. Single, dating or married, his wise words will impact how you pay attention and bring life to those around you. That was me whining about my “alone time” just after my wife and I had our first two children. My mountain bike time was waning, and I felt like my soul was withering. Luckily, my wife knows me, and truly understands that when I come back from the mountain, instead of a Grizzly I’m a Teddy Bear. Fast-forward five years and another little pixie-daughter and selling our house and moving to Oxford, England. Chris, my wife, gave up her familiarity, her friends, her first house, her nice back deck, her hot summers so that I could pursue a PhD in theology. We now live in a rental on the English countryside, a quick bus ride from Oxford City Center. I get to study in the epic library and meet with my supervisor in one of the colleges. I get to ride my mountain bike into town and walk along the Thames. But I realized that while I’m researching and writing, two things I love to do, Chris is hard at work with the girls; changing diapers, planning meals, home-educating our oldest, researching curriculum, and folding laundry. Though we both were working hard at our vocations, I wanted Chris to experience the richness of Oxford. Plus, I know she likes to have time to herself; to have a quiet coffee (with caramel and milk and other gross things she likes in her coffee), to browse the plethora of vintage Oxford shops, to visit second hand bookshops, to soak it all in. So, one morning after we arrived I told her that it was important to me that she experience this gift of an opportunity in Oxford as deeply as I was. “Babe, I want you to plan on taking every Saturday morning and spending it alone in Oxford. I don’t want you to be here for two years, yet miss it.” And believe me, she never misses a Saturday. She bounds out the door, but also bounds back in the house when she returns hours later. The time nourishes and grows the love blossom nestled in her soul. When I find the time to stop my whining, and turn my eyes towards Chris; when I consider what it is that makes her special, what makes her glow, and what renews her spirit I find the blossom of our love thriving within me. It brings me great joy to help her shine. Chris and I both need “alone time” to refuel. And just like I take initiative to discover her need and figure out a creative way to meet that need, Chris is quick to offer me the time I need on the English countryside. She even agreed to let me hike in the Icelandic wilderness for several days! She knows me, and that takes time and intent and time away from her own needs and desires. Relationships, in my opinion, are about time. And not just time to ourselves. It takes time to know someone. It takes time to reflect on their needs. It takes time to do something for the other person–something you know will nourish their love blossom, something that will quicken their step, liven their heart, and stretch a smile across the canvass of their life. I always tell Chris that one of the best things we can do for our girls is be our truest selves. Some people leave their identities in the hospital when they have kids. It’s time to be a parent, a wife, a husband, and sacrifice everything for them. That’s not true. My girls will gain much more if I take them along for the ride of my life and Chris’s life. So, when they see Chris flourish, happy and being “Chris” they learn and grow from this true person before them. This beautiful woman who possesses a brilliant intellect, passionate desires, and ambitious goals. It’s the same for men as well. Chris pushes me into my dreams. She sold everything so we could pursue a PhD. She wants me on the mountain with my Salsa fat tire bike. She gives me space to create and write books. She sends me off to the Icelandic wilderness. My girls see and interact with a daddy who lives in the glory of the person God made him to be. Look at that person across from you. What can you do to make them flourish in the joy of who God made them to be? Are you spending more time figuring out the margin they need than you are whining about the time you don’t have? Remember, we all need a little time. That’s how our love grows–in the tick-tick-ticking of serving the other, in the sweet intent of helping them be the person God made them to be. 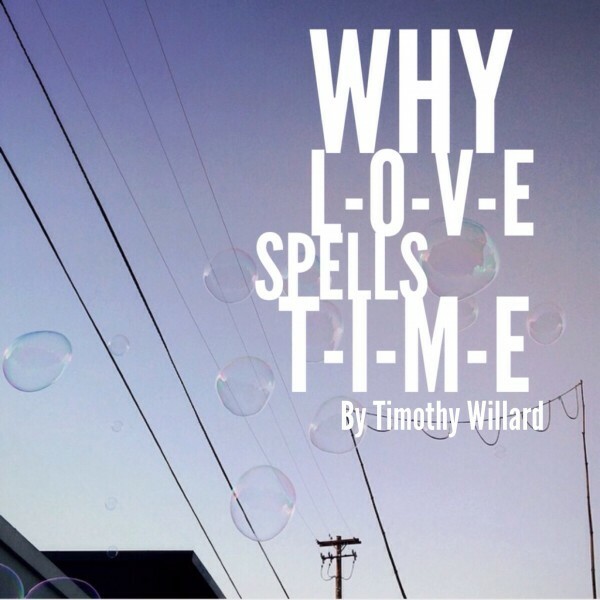 Timothy Willard serves as Spiritual Director for the Praxis Nonprofit Accelerator and coauthored the newly released Home Behind The Sun and the critically acclaimed Veneer . He is a PhD candidate at King’s College London and lives in Oxford, England. When he’s not scratching poetry, chasing the scholar’s craft, or carving trails on his mountain bike, he enjoys making up faerie stories about the English countryside for his wife and three pixie daughters. Sign up for Tim’s must read weekly digest Sixty-Six North. Follow Tim on Twitter HERE. Friend him on Facebook HERE. Check out Tim’s photos on Instagram HERE. Brilliantly written! I’m not married but my 3 younger siblings are. And each of them have families of their own now. I definitely see each of them and their spouses sacrificing for eachother in ways similar to this. It is lovely to see. Thanks Zack! I know Tim would have responded to the kind words but I think his wife reciprocated the love and he is on dude trip right now. (-: So I’m saying thanks for him. Love that you (Joy) took Tim’s wisdom and delivered to a bunch of wise individuals who can plan ahead for marital success. Sharing this post with the Future Marriage University (FMU) community at https://www.facebook.com/FMUniversity. Having Timothy post was a good idea. I know many couples who think needing alone time means there is something wrong with there marriage. Well, Spencer, I just returned from some alone time in Iceland 🙂 and I’m happy to announce we’re fine and dandy. Ha. But seriously, nothing recharges my wife more than her Saturday morning alone time in Oxford. I think we all need time to think and be quiet and do things “alone.” We find it to be very rewarding. This is an outstanding post. Love it. My husband is leaving today for his annual dude trip, and while I am going to miss him, I know how important it is for him! Luckily, he’s amazing about encouraging me to take the time that I need too. It makes us healthier for each other in the long run. Haha well said and thanks for all the visuals Rahel!